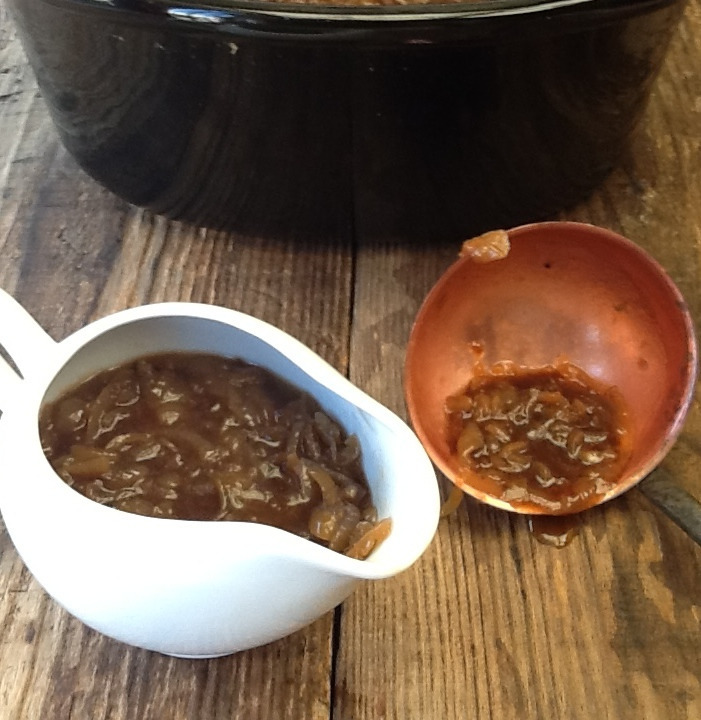 Slow Cooker Onion Gravy – Make your own rich, sticky onion gravy in your Crock Pot. Perfect with Bangers & Mash, Toad in the Hole or a tasty nut roast! 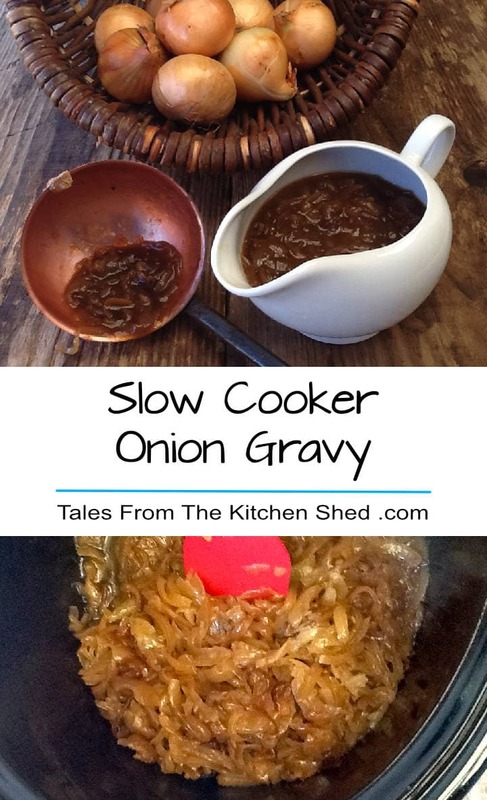 We love our Slow Cooker Onion Gravy with good old Bangers and Mash as it seems the right comfort food combination for this time of year. Onion gravy is the perfect accompaniment for Toad in the Hole too and also goes down a treat with our nut roast – however you eat it, it’s so much tastier than gravy granules and all that MSG. 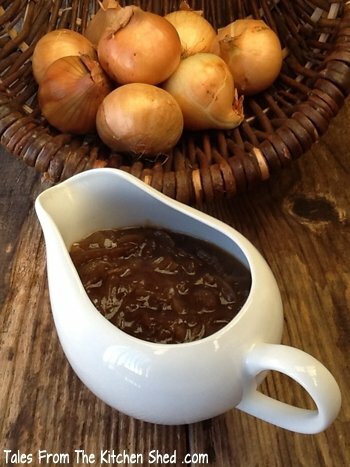 Onion gravy is ideal for slow cooking not least because it’s so much easier to caramelise onions in the slow cooker. 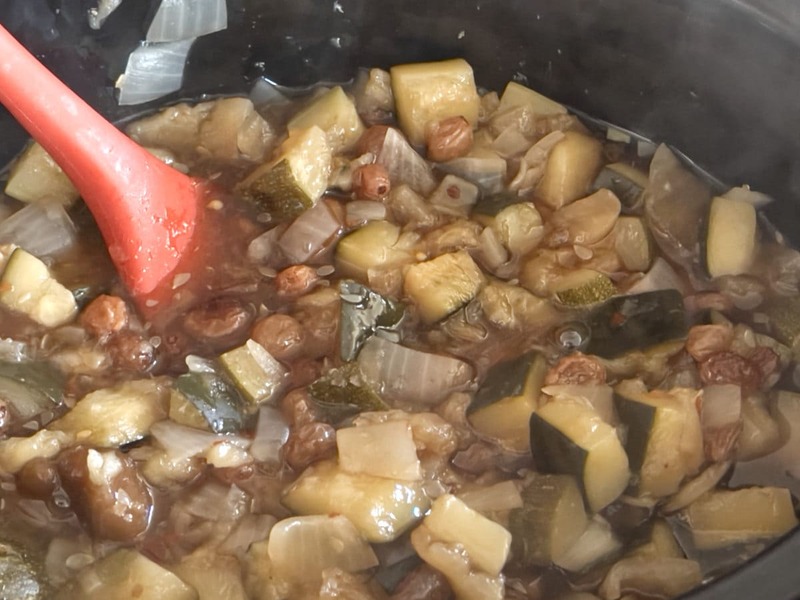 You get the characteristic rich, sticky flavour (essential to the perfect onion gravy) without the need to stand over a stove stirring onions – simply let the slow cooker do the work for you. It’s the perfect onion gravy for meatlovers and vegetarians alike but using a good quality stock (beef or vegetarian) is essential. I usually opt for a vegetarian stock and I find the gravy isn’t as dark a gravy as using a beef stock, so I add a tablespoon of soy sauce. If you want to heat it up a bit, try adding a teaspoon of horseradish sauce. Grease the inside of your slow cooker pot and add the onions, oil, butter and salt. Stir and place on the lid. Cook on low for at least 6 hours (8 hours if you have the time) to caramelise the onions. Once your onions are caramelised, add the wine, hot stock, balsamic vinegar, Dijon mustard and thyme and give it a good stir. Turn your slow cooker to high and whisk in the cornflour water mix. Replace the lid on your slow cooker but this time prop open the lid with a wooden spoon or spatula. Cook on high for 1 to 2 hours. 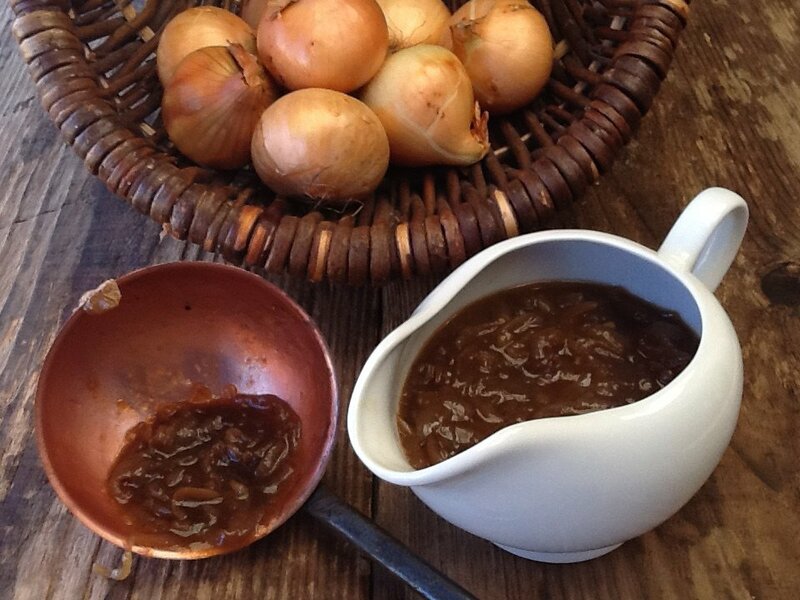 Ladle your onion gravy into a jug or gravy boat. Serve with a big bowl of Perfect Mashed Potato and sausages. Farmersgirl Kitchen & Baking Queen74’s Slow Cooked Challenge hosted by Janice over at Farmersgirl Kitchen. Could this be portioned up and frozen? Thanks for popping by Kathy, the onion gravy freezes well, I often put portions in the freezer, they come in really handy. This actually sounds like my idea of heaven. Oh my goodness gracious me I’m salivating!! Thank you for sharing with Credit Crunch Munch! Never thought to caramelise onions in a slow cooker. Brilliant idea. And I love onion gravy. I always add a bit of tamari to mine. I’ve never thought of using the slow cooker to caramelise onions, what a brilliant idea! I’ll definitely be making this. Thanks Jane, let me know how you get on. 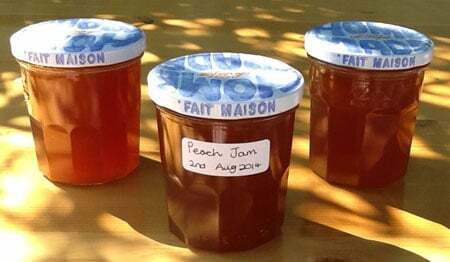 Thanks Jane, pleased to hear you like the recipe, the slow cooker certainly does free you up to get on with things. I love the sound of venison sausages, I bet they were delicious. Oh how lovely. That sounds so rich and just perfect. Sausages or toad in the hole? I’ve never had onion gravy, but I love onion soup and gravy and this seems the perfect combination of both. I can definitely see it over mashed potatoes, even roasted veggies. Delish! Perfect for this time of year. One restaurant that I worked in used to make what they called “Smothered Chicken” and it was a chicken breast topped with sauteed onions, a slice of melted provolone cheese and then served with mashed potatoes, the whole thing was covered in gravy, and oh so delicious! I can see this gravy replacing the separate sauteed onions and gravy and making it even more to my taste! 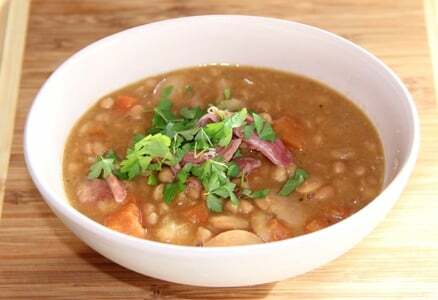 And I love that this can be done in a crock pot, my favorite kind of meal!!! Thanks. Pinning! 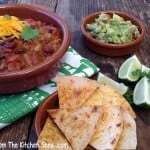 I love this recipe, and the fact that you put it in the crockpot! Yum! Oh that looks so delicious!! I love onions in every form!! Stopping by from #WAYWOW! I’d love to have you come over and link your post up to my craft/recipe party which starts at 7pm EST. and is new every Thursday! I also pin every post! When I was at uni our treat dinner was sausages, mash, Yorkshire puddings and onion gravy. It’s still one of my favourite dinners now – totally delicious and real comfort food.